Illustrations: 46 b/w photographs, 2 line illustrations, 3 maps. At a time when women could not vote and very few were involved in the world outside the home, Annie Montague Alexander (1867–1950) was an intrepid explorer, amateur naturalist, skilled markswoman, philanthropist, farmer, and founder and patron of two natural history museums at the University of California, Berkeley. Barbara R. Stein presents a luminous portrait of this remarkable woman, a pioneer who helped shape the world of science in California, yet whose name has been little known until now. Alexander's father founded a Hawaiian sugar empire, and his great wealth afforded his adventurous daughter the opportunity to pursue her many interests. Stein portrays Alexander as a complex, intelligent, woman who--despite her frail appearance--was determined to achieve something with her life. Along with Louise Kellogg, her partner of forty years, Alexander collected thousands of animal, plant, and fossil specimens throughout western North America. Their collections serve as an invaluable record of the flora and fauna that were beginning to disappear as the West succumbed to spiraling population growth, urbanization, and agricultural development. Today at least seventeen taxa are named for Alexander, and several others honor Kellogg, who continued to make field trips after Alexander's death. 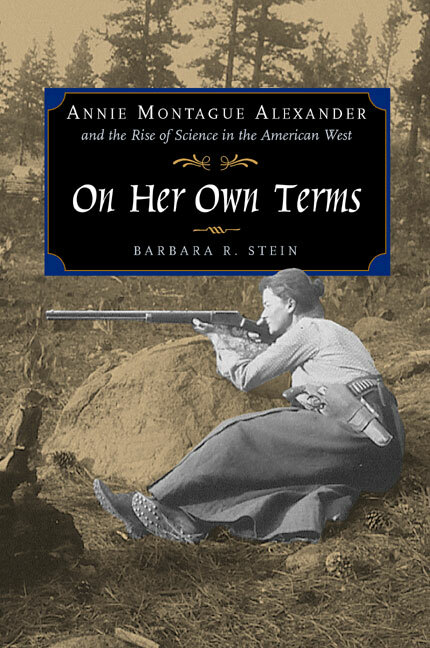 Alexander's dealings with scientists and her encouragement--and funding--of women to do field research earned her much admiration, even from those with whom she clashed. Stein's extensive use of archival material, including excerpts from correspondence and diaries, allows us to see Annie Alexander as a keen observer of human nature who loved women and believed in their capabilities. Her legacy endures in the fields of zoology and paleontology and also in the lives of women who seek to follow their own star to the fullest degree possible. From 1985 to 2000, Barbara R. Stein was Curatorial Associate and Researcher at the Museum of Vertebrate Zoology at the University of California, Berkeley. Her book about Alexander grew out of a 1994 symposium on the history of women at the Berkeley campus. 16. From "A Friend of the University"
25. Hawaii--"My Only Real Home"